Product #6235pink. 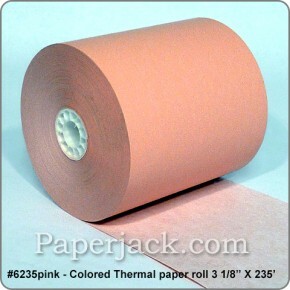 Case of 50 rolls of (3 1/8" width X 235' length X 3" diameter) premium quality, PINK colored thermal paper rolls. Note: You can combine cases from different sized paper rolls to reach quantity discount levels. The cart will automatically calculate the discount price for the selected items. Roll Diameter: 3in. (76mm) approx. Secured with Adhesive Tab (not glued): For quick opening and installation of roll. FREE Shipping FREE Shipping to business addresses! Residential addresses (homes & home-based businesses) will have to pay the UPS surcharge for residential delivery. Packaging: Rolls are shrink-wrapped interpack layers within box. Same Day Shipping: For orders placed by 2:00pm EST.